Any French Fry lovers in the house? These roasted potatoes aren’t fries, but they hit the spot with their crispy edges and soft middle. 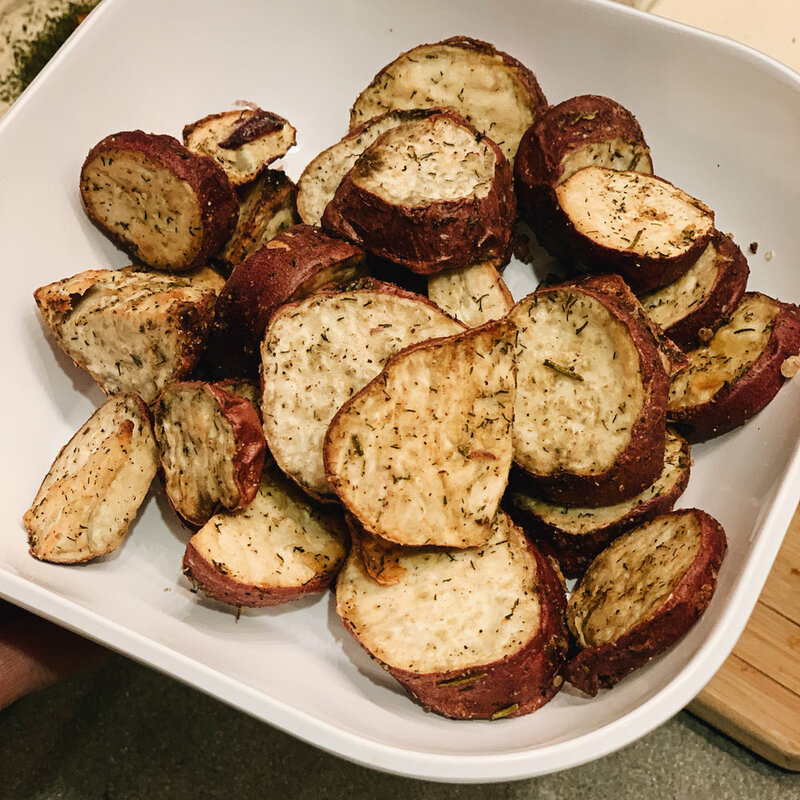 I added some dill, rosemary, garlic, and sea salt which was the perfect savory flavors for these sweet potatoes! I drizzled in a homemade Tzatziki sauce for a combo dreams are made of! Place all ingredients in a bowl or plastic bag and mix to coat potatoes evenly. I used a crisping basket pan like this one and roast the potatoes until crisp, about 30 minutes. You can also use a baking sheet with parchment paper and flip potatoes after 15 minutes to crisp evenly on both sides. Add all ingredients to a mixer or blender and pure until smooth. Add more water for a thinner consistency. I made an amazing plate of goodness with salad, hummus, some quinoa and chickpeas, and these potatoes drizzled in tahini sauce. It was so delicious! Hope this gets your creative cooking ideas poppin’!